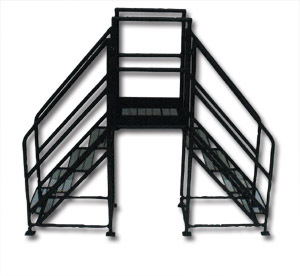 Material Handling Solutions is your source for Crossover Ladders and other industrial equipment. Crossover ladders are efficient in places where you need permanent crossover points. Crossover ladders are used anywhere you need to crossover conveyors, pipes or other obstructions. 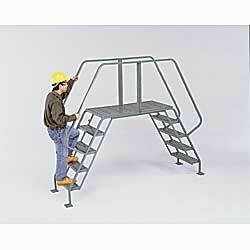 We also carry tank maintenance ladders to do maintenance on tanks, buildings or other hard to reach places. We carry fixed crossover and 800 lbs capacity work platforms. So please take your time and browse our site for more industrial ladders. If you have any questions please call toll free and a specialist will be happy to assist you.